Sporthorse Market LLC d/b/a Dressagemarket.com is a Limited Liability Company organized under the laws of the State of New Hampshire (hereinafter “Dressagemarket.com”). Dressagemarket.com is NOT an agent, broker, or dealer in horses and is not a partner or joint venturer with any such agent, broker, or dealer advertising horses for sale, lease, at stud, tack, equipment, and services. Dressagemarket.com offers the service of ONLINE CLASSIFIED ADVERTISING for horses for sale, lease, at stud, tack, equipment and services. BY POSTING AN AD(S), ALSO REFERRED TO AS A LISTING(S), WITH DRESSAGEMARKET.COM, THE USER AGREES TO ALL TERMS AND CONDITIONS DESCRIBED HEREIN, WITHOUT EXCEPTION, DELETION, OR AMENDMENT. NO AMENDMENT OR MODIFICATION IS AUTHORIZED OR ACCEPTED. Dressagemarket.com acts as a venue for listing horses and other items for sale. It has no involvement or interest in any transactions between buyers and sellers. In the event of any dispute between one or more users, you agree to release Dressagemarket.com and its owners, members, managers, agents, subsidiaries employees, successors, and assigns from any and all manner of action and actions, cause and causes of action, suits, debts, dues, sums of money, accounts, reckonings, bonds, bills, specialities, covenants, contracts, controversies, agreements, promises, variances, trespasses, damages, judgments, extents, executions, claims and demands whatsoever, in law or in equity, which against Dressagemarket.com you have or may have or which your personal representatives and assigns hereafter can, shall or may have relating in any way to your use of the venue provided by Dressagemarket.com and you agree to indemnify and hold Dressagemarket.com harmless from any and all loses, expenses (direct or indirect), attorneys’ fees, court costs or any related charges resulting from any of the foregoing. Dressagemarket.com does not guarantee the sale or lease of your horse, tack or your services. Dressagemarket.com does not guarantee the owner/seller's services, representations, or any horse's performance or fitness for a particular purpose. Dressagemarket.com strongly recommends that a pre-purchase exam should be performed by the buyer's equine veterinarian of choice, on any horse prior to purchase. Dressagemarket.com does not guarantee or warrant the performance of any person or entity advertising on its site. Dressagemarket.com does not control the content posted on the site and, as such, does not guarantee the accuracy, integrity or quality of such content. Dressagemarket.com does NOT insure receipt of your purchases from third parties. Dressagemarket.com recommends that you place insurance and tracking on all shipped items. Owners are solely responsible to proofread ads and confirm that correct photos are appearing on ads. Owners are solely responsible for early deletion of ads. Owners are solely responsible for marking horses as sold. Service interruptions may occur from time to time. Dressagemarket.com does not guarantee uninterrupted service, nor shall it be responsible for interrupted service. All advertisement listings are subject to reasonable editorial changes or deletions. Dressagemarket.com is not responsible for typos or errors appearing on advertisements. Photo(s) will remain on the ad until (i) the horse is SOLD, (ii) removed by the owner, (iii) requested to be removed by the BUYER, or (iv)90 days subsequent to date of posting, whichever comes first. All fees paid are non-refundable. Notwithstanding anything elsewhere set forth herein, Dressagemarket.com reserves the right to delete ads for sold horses without notice to seller upon the request of the buyer. 1. All Horse and Tack/Equipment listings must state the price. Including the price in your listing allows Dressagemarket.com to display listings by asking price. This also allows your listing to be included in the Horse Alert Email service, leading more potential buyers to your advertisement. 2. 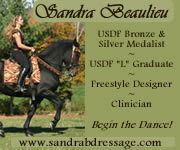 Listings on DressageMarket.com are for advertising your dressage horse or tack/equipment only. These listings are not meant for advertising multiple horses or to provide a link toward your sales, breeding or training facility. DressageMarket.com invites you to list your dressage-related business in our Directory. Slanderous, malicious, derogatory, or profane ads are not permitted on Dressagemarket.com. Ads for horses with ownership disputes are not allowed on Dressagemarket.com and will be declined for service. Dressagemarket.com reserves the right to disable any account without notice in the event that the user is engaged in, or suspect of engaging in, fraudulent activity via our site, false or misleading advertising, or any other activity in violation of any federal, state, or local, law, rule, or regulation. If you have a complaint about a seller on our system, please Contact Us with the details. Solicitation or spamming of other Dressagemarket.com users through our site or ads is strictly prohibited. If you send any type of unsolicited email to other users of our site advertising your own services, your account will be disabled, your ads will be deleted, your email will be blocked from further ad responses, and you will be marked on our site as a spammer. If you see a slanderous or malicious ad on our site or receive unsolicited email from another user such as someone trying to sell you his or her own services via our ad response forms, please file a scam/spam report through Dressagemarket.com's Contact Us page. Dressagemarket.com is not liable for violations by users and customers, including but not limited to, copyright violations, trademark violations, trade names or patent violations, or other content which is in violation of any local, state or federal law, rule, or regulation. Dressagemarket.com reserves the right to disable any account in violation of, or suspected to be in violation of, any of the foregoing. Our customers shall be solely responsible for obtaining express permission from professional photographers, subjects, etc. to display images on our site. Dressagemarket.com will not accept any images labeled "PROOF" for use on our web site. If there is a visible photographer's signature or label on the face of a photo, Dressagemarket.com will not remove this information from the digital image that we display. If we are informed of copyright violations created by our customers, Dressagemarket.com reserves the right to remove disputed images from the site without refund or prior notice to the offender. Dressagemarket.com may, in appropriate circumstances and at its own discretion, disable and/or terminate the accounts of users who have infringed, or are suspected to have infringed on the copyrights of others. If you are a photographer, please be sure to contact your customer directly about their inappropriate use of your photo. Dressagemarket.com is not responsible for photos lost or damaged in the mail. While Dressagemarket.com cannot and does not give legal advice, we do have some general recommendations for buying and selling horses: Dressagemarket.com strongly recommends that a Vet-Check or Pre-Purchase Exam should be performed on any horse being considered for purchase by the buyer's Equine Veterinarian of choice. Always be sure to specifically ask the seller if the horse has any soundness issues, vices, or other problems. You should never complete a transaction without first writing down the terms of the deal and have each party sign it. Always PRINT and KEEP a copy of any ad used to buy or sell a horse on our site. Dressagemarket.com DOES NOT KEEP ANY KIND OF ARCHIVE OF DELETED OR EXPIRED ADS.